The early truck were made to be worked hard and then scrapped. This truck was near that. My Fargo truck was purchased in Brussel, ON and I could see an attempt had been made to restore her. Most of her original parts we discarded, substituting newer Dodge parts that did not belong. The first history shows this truck in 1936 is #161 of 864 built. The name on the door shows that it belonged to Luke’s on 2215 Danforth. After that, it passed through more owners until in the 70’s, Jack Durnin found it for sale on Highway 6 north of Kitchener. Later it was sold to Don McNeil in the late 70’s, who then sold it to someone who tried to have it restored. Unfortunately, it went from bad to worse, and was sold back to Don, where it was then stored in a dilapidated state in his backyard museum for over 20 years. I came to her rescue in the Fall of 2013 when I decided to restore this rare 1936 Fargo, a Made in Canada icon, the first year for the Fargo. Many hours were involved in research before restoration could begin. Information was very hard to come by. I fabricated many of the part in my custom metal shop. What was to be a simple restoration turned out to be a mind-boggling job, and which is still going on. I have not found any other person to consult or even have some knowledge on a ’36 Fargo. What make the ’36 Fargo unique is it the only year of the “Flying Lady” hood mascot. This mascot was the hardest to find, and took over a year to locate in St. Louis, IL. To date, it is the only one I know of in North America. Once I had this in my hands, I knew this truck would be complete. The journey has been frustrating at times, but fulfilling now that I can show you this unique 1936 Fargo Truck. 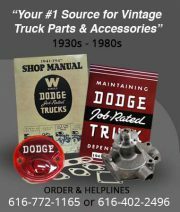 This entry was posted in Customers' Projects, DCM Classics, Projects and tagged 1936 Fargo, 1936 Fargo Truck, @dcmclassics, DCM, DCM Classics, Fargo, Fargo Truck. Bookmark the permalink. I have seen this truck in person, beautiful from top to bottom, wonderful job! !